After Boston Bruins sniper David Pastrnak scored three goals in a 5-1 win at home in the first meeting of the regular season against the rival Toronto Maple Leafs last fall, Pastrnak remarked, "I love beating Toronto." But the 22-year-old Czech right wing had not done much to beat the Maple Leafs in the opening-round series between the two Original Six clubs. He had played such an important role in the Bruins' seven-game win against Toronto in last year's playoffs and built off his strong post-season with a career-high and team-high 38 goals in 66 games this season. However, Pastrnak had failed to score in the first three games of the series and his lack of production played a role in why the Bruins trailed the Maple Leafs two games to one. Bruins head coach Bruce Cassidy, however, found a way to provoke his leading scorer in Game 4 in Toronto on Wednesday. Pastrnak was plucked off Boston's top line and placed alongside his fellow countryman David Krejci on the second unit. That freed up Pastrnak from the close checking of the Maple Leafs. He found his legs and when he was put back on the Bruins' top line with Patrice Bergeron and Brad Marchand, Pastrnak found his groove. 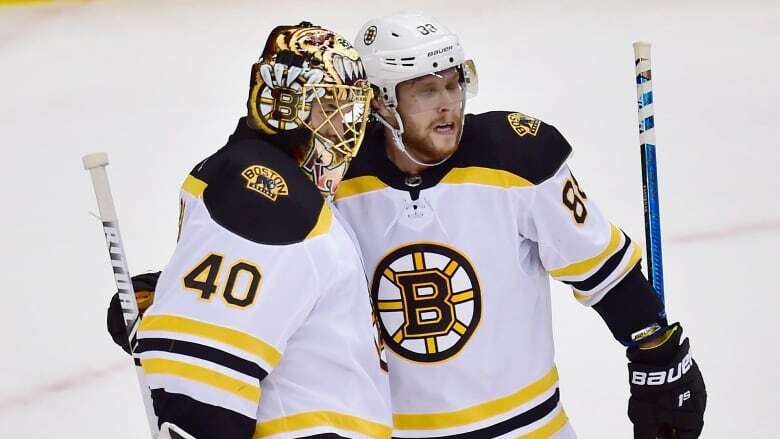 He twice converted passes from Marchand to lead the Bruins to a 6-4 victory to tie the best-of-seven series 2-2. "He wasn't on the top of his game," Cassidy said. "So it was just a case of moving him around. "He's a guy we rely on to score big goals and provide offence … It was good to see him score. When scorers don't score they get antsy. I'm not saying he was [antsy] but we didn't want him to get there." Not much has separated these two teams through four games. The Bruins have scored 13 goals. Toronto has 12. Boston leads in shots by a slim margin of 148-140. The series has been tied for 54 minutes and 50 seconds, with the Bruins enjoying a lead for 117:17, compared to the Maple Leafs at 67:53. So any edge Cassidy or his Toronto counterpart Mike Babcock can gain usually results in a win. Babcock's big move was to reduce the ice time of defenceman Nikita Zaitsev in Game 4. He had some tough luck on Marchand's goal when he got hit in the hand and appeared in pain as he stumbled and allowed Marchand to shake free. On the first Pastrnak goal, Zaistev blocked the first Marchand pass attempt. But the puck bounced back to Marchand who found his teammate with his second pass attempt. Like in the regular season, the Maple Leafs continue to fall asleep for extended periods only to have their all-world goalie Frederik Andersen bail them out. He did it again in Game 4. After quick, early goals from defenceman Charlie McAvoy, on the power play, and Marchand, the Toronto goalie made a massive stop on Boston centre Charlie Coyle to keep the game at 2-0 and allow the Maple Leafs to tie the game early in the second period. The Bruins went ahead 4-2 on Pastrnak's second-period goals and this time Andersen couldn't keep his teammates close as Zdeno Chara scored early in the third period. But, as they have so often, the Maple Leafs decided to turn on the offensive tap to pull within 5-4 late in the third period before the Bruins could breathe easy with Joakim Nordstrom's last-second empty-net goal. The Bruins have home-ice advantage back, but they best win two games in a row if they want to beat Toronto two years in a row. Easier said than done in this see-saw battle. The Maple Leafs, meanwhile, who opened the series with a Game 1 win in Boston, hope this win-one, lose-one trend continues in their favour. But they will need a more consistent effort than they put forth in Game 4. And maybe the next chess move comes from Babcock instead of Cassidy.